Edward Estlin Cummings, commonly known as E. E. Cummings, was a groundbreaking poet and painter. He was from Cambridge Massachusetts, and most of his poems were free verse and on the subject of nature, romance, life, or death. E.E. was an expert at ignoring convention. Grammar and syntax were not used properly by Cummings (gasp! ), but were struck down and reused in an unorthodox manner for dramatic visual effect. He often broke individual words into pieces and rearranged them in a seemingly insane way, but there was a method to his madness. In this way, he was absolutely revolutionary. His poems often show a careful consideration for the movement of the reader’s eyes, and a deep understanding of the individual letters that make up the words of his poems. 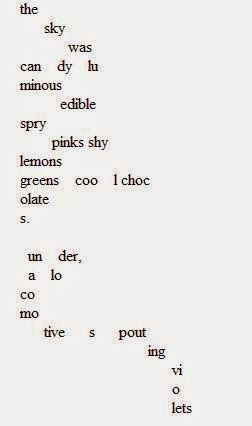 The actual words, if you were to strip the poem down, and blankly read it out loud (the horror!) are as follows: “The sky was candy luminous edible spry pinks shy lemons greens coo1 chocolates under a locomotive spouting violets.” Those words create a beautiful description of a sunset. It’s the type of half-crazed passionate descriptions that are typical for a Cummings poem. The reader can almost see him, with his eyes bugged out, excitedly throwing his arms in the air as he describes the wonder of a sunset. However, Cummings takes it further than just using descriptive words. He forces the reader to feel dizzy in wonder, as well. Have you ever watched a sunset, taking in the different shades of color here and there, and types of clouds in the sky, and realized that your eyes were dancing around so much that you’re starting to feel a little nauseous?